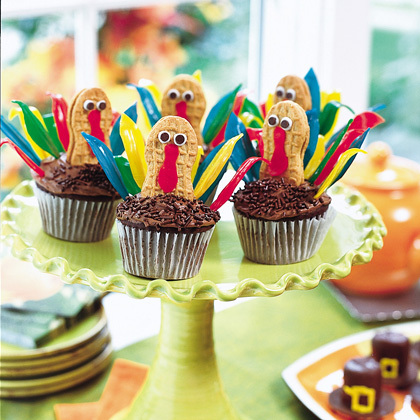 Looking for some adorable baking ideas for Thanksgiving? Here are a ten absolute gems that I found. 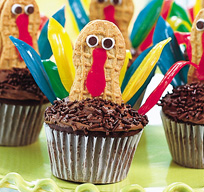 They like lots of fun to make with kids or, heck, have fun making them all by yourself! 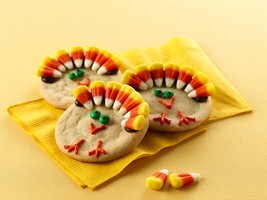 In my mind these are winners of most ingenious use of nutter butters cookies. Oh and let’s not overlook the clever use of colorful fruit roll-ups for the feathers. 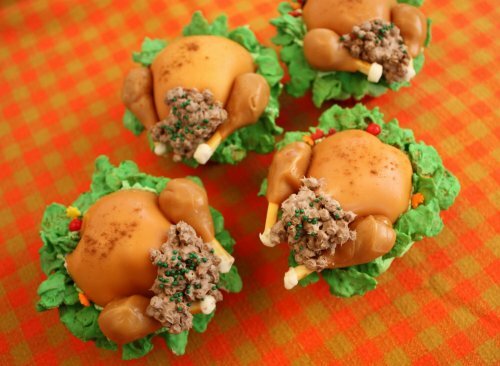 Find this recipe and instructions at familyfun.go.com. 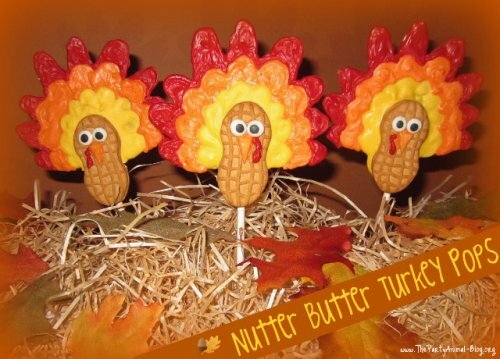 Not to be outdone by this clever use nutter butters cookies, we have turkey pops! Find the instructions for these cuties at thepartyanimal-blog.org. OK, let’s just come right out and say it… These are both creepily realistic and awesome! I included a closeup because the use of tiny green nonpareils as peas is just plain genius. 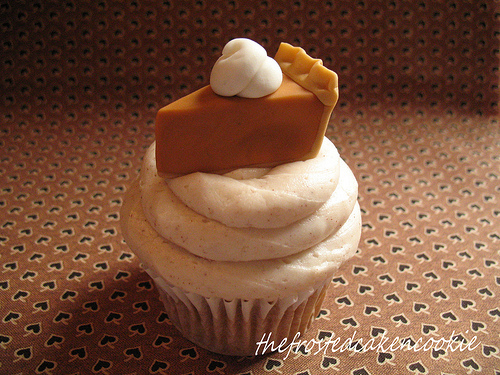 These pictures are from a great tutorial at saucysprinkles.com and the original idea came from the cookbook What’s New, Cupcake?. 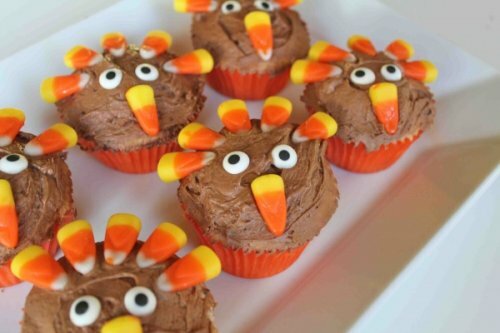 I love how devilishly simple and yet very cute these candy-corn-encrusted cupcakes are. The creator of these cupcakes says that the sugar “eyes” are from a local bake shop but I bet there are lots of fun things you could substitute in if you can’t find them. Find the instructions at cookingwithmykids.com. 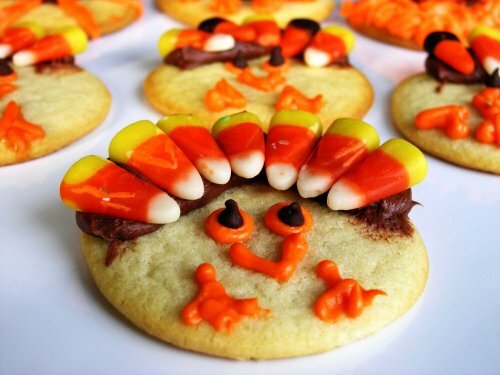 And if the idea of packing away en entire cupcake after your Thanksgiving meal is just too daunting, these sugar cookies are just as sweet. Read how to make them at thetribunenews.com or where the recipe originally came from at pillsbury.com. 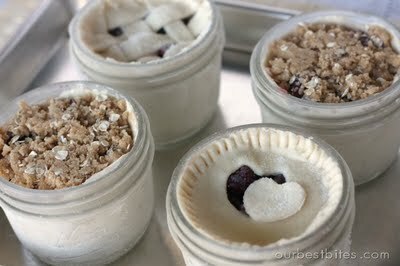 Single serving pies in a jar. Need I say more? You can find great instructions at inchmark.squarespace.com and at ourbestbites.com. 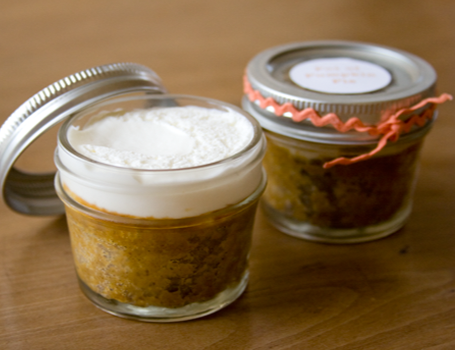 Now excuse me while I try to insert my spoon right into the screen so I can take a bite of that whip cream-topped pumpkin pie. 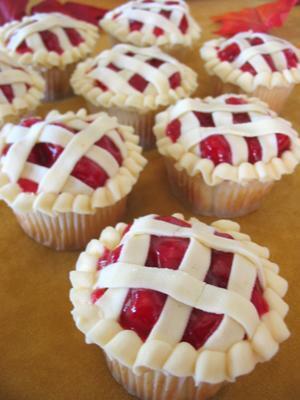 Just to throw your Thanksgiving guests for a loop, confuse them with some cupcakes that look like miniature cherry pies. 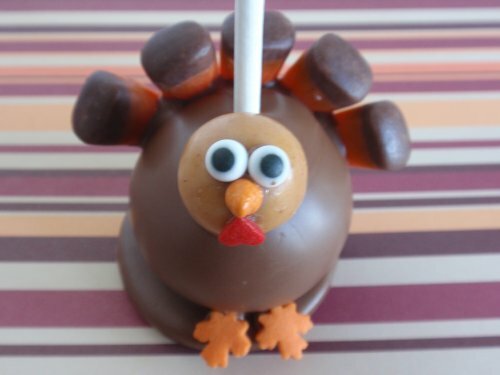 These might look complicated but you’ll be surprised at how simple they are to make when you read the instructions at cake-decorating-corner.com. 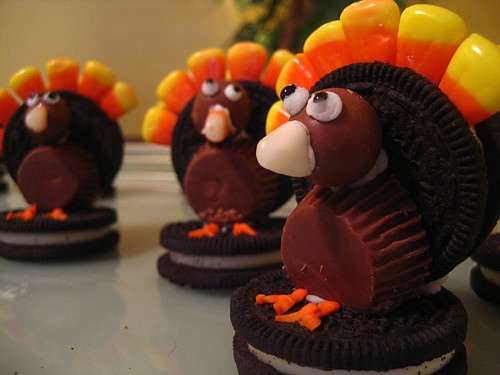 How can you go wrong with a dessert made from oreos and peanut butter cups? You pretty much can’t. Read the instructions for these by Flickr user Coopet Photography. 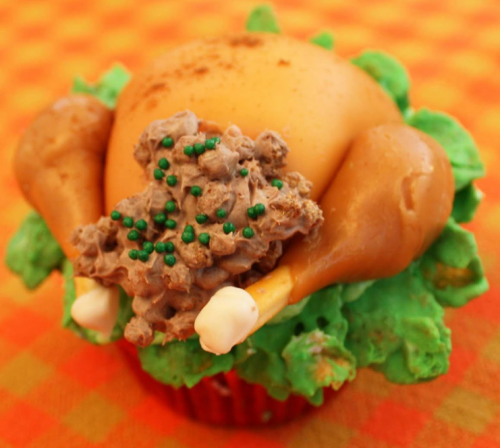 This cute cupcake requires you to use fondant icing but it looks well worth it. 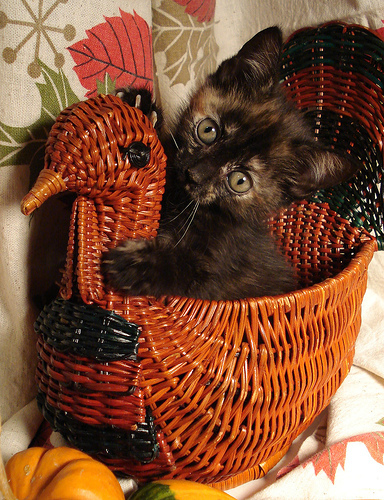 It’s adorable and beautiful. Read the instructions at thefrostedcakencookie.blogspot.com. 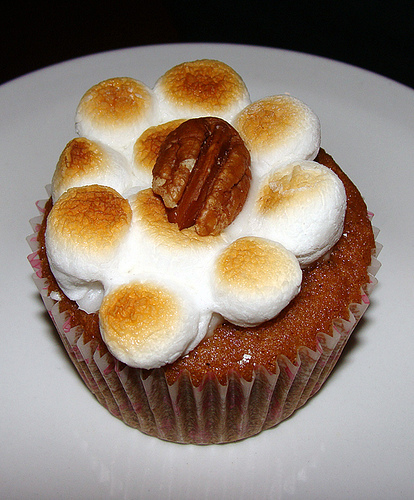 A cupcake that tastes and looks like sweet potato casserole complete with toasted marshmallows? Yes please. Find this recipe at ironcupcakemilwaukee.com.